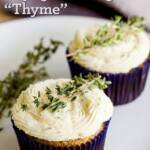 Thyme turnip cupcakes taste like the smell of a garden on a dewy morning. They're herbal and fresh with a little zing from the turnip and a touch of sunshine from the addition of orange juice. In a medium-sized bowl, whisk together flour, thyme, and baking soda and set aside. In a large bowl, beat butter and sugar until fully combined. Mix in the mashed turnips until fully combined. Mix in the eggs and orange juice until fully combined. Mix in the flour mixture a little bit at a time until just combined. Fill cupcake liners just over halfway full. In a medium-sized mixing bowl, beat butter with an electric mixer for three minutes on high speed until light and fluffy. Mix in thyme and orange juice until fully combined. Optionally, top cupcakes with fresh thyme.